Rob And Gary At Work! We return to Tunnel Road in Port Henry, New York tonight. Having been presented with news of CP train 643 coming north out of Albanys Kenwood Yard during the night behind SD 40-2 5972, it was too much of a coincidence to ignore. These christmas lights in the backyard of the Finnessey residence would only be here for a short time. 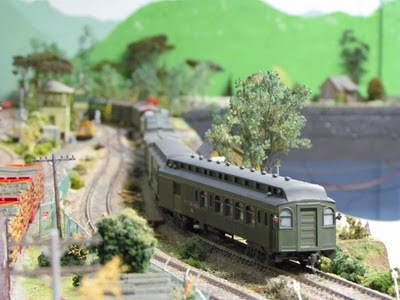 To shoot an SD 40-2 passing by would be a nice christmas present eh? LOL! Well.......I thought so to, and made up a thermos of green tea before driving over to the free ferry crossing of Lake Champlain at Crown Point. Arriving on Tunnel Road, I was again in admiration of this scene. Even Mother Nature came through this year with snow for christmas. 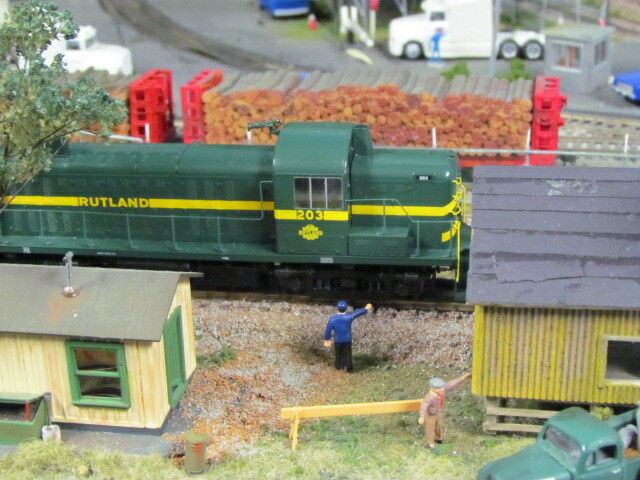 Due to their nature, christmas lights are difficult to discover as a prop for photos before they are taken down, never mind finding them trackside! Here in Port Henry was a wonderful opportunity. 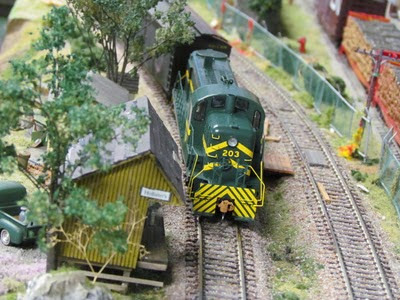 First train by was 930, which became a practice shot with its black and white NS leader. Forty five minutes or so later 930s crew was overheard on the scanner talking with a passing train at Fort Ticonderoga to my south, and when the crew acknowledged the talking equipment detector, it was 643! About a half hour away, the scene was set! After making the necessary adjustments to the lighting for a northbound train here, I stopped before I fiddled around too much, and retired to the civic to enjoy some green tea. Ha,ha,ha! Life is great at moments such as this. 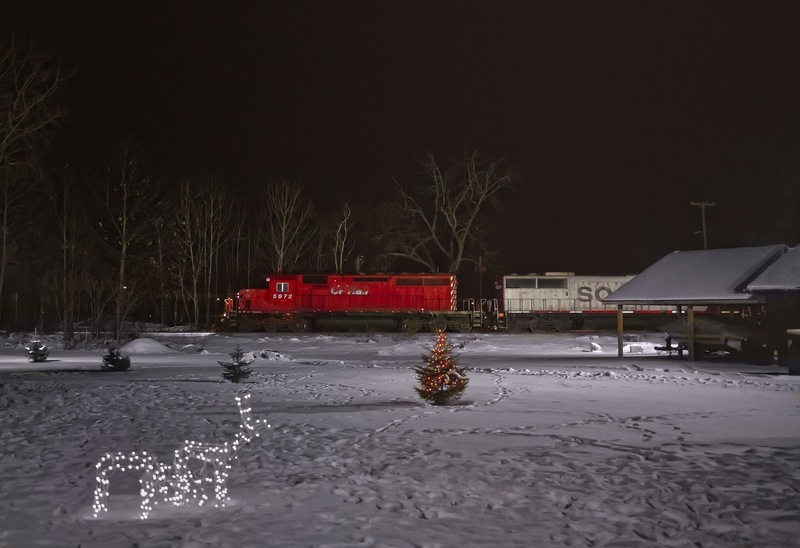 Being able to include trackside christmas lights is another appeal of shooting trains in motion at night. Five thirty passes as I maintain my vigil hovering around the tripod mounted camera, thinking any minute now.......... Then the moment manifests like a sequence in a dream. While I'm listerning for an air horn, the crossing signals go off at the nearby grade crossing. I'm looking southward, and see nothing! Then movement way off to the right, headlights moving in the dark, three of 'em. Over there? I think, taken aback at the railroads location having never shot northbounds here before. Then the headlights are turning towards me, an air horn blows for the crossing, and we're on. With engineer Rob Dennis at the throttle, 5972 emerges from behind the shed, gliding into position where a silent flash captures the moment. What a christmas card scene! With an SD 40-2 no less! Thanks for the great runby Rob! Shot in Port Henry, NY on Decemebr 24, 2010 at 05:33. Please enjoy! Comments are welcomed. 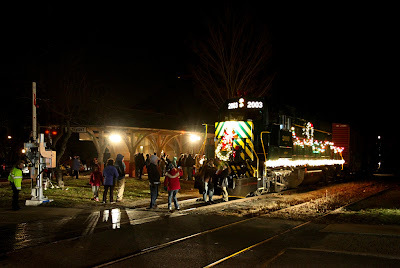 On December 5th I took part in the annual Toys For Tots Train on the northend of the D&H. It was awesome and I got a lot of great pics and memories! 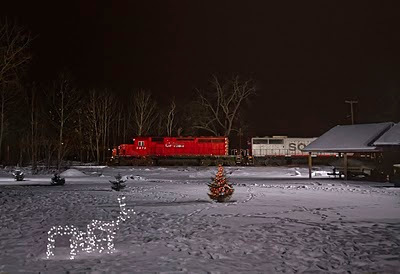 Unlike CP Rail, the SVRR can't afford to run a special train for Toys for Tots, but they get the job done by tacking the Frazier, with the big guy himself aboard, onto the rear of the Milk Run.Here we see Conductor J.J. Keys of the Milk Run giving Santa some updates on the Naughty or Nice List as he loads with milk at Hollister's. 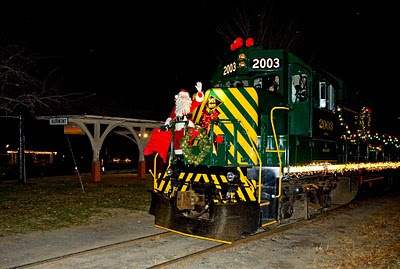 Engineer Al Fish on the Milk will soon back onto the Frazier and tomorrow morning will visit American Legion Post 83 where the Wednesday Night Train Group will chip in the help with the toy distribution. 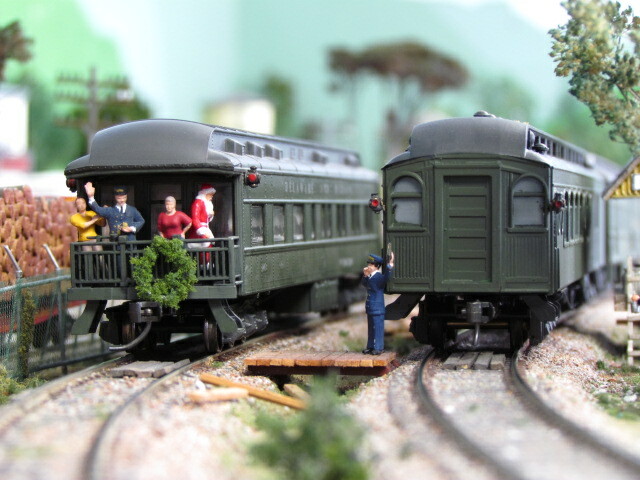 It's getting crowded on the Frazier but Santa and Flagman Lafayette say the Twins are more then welcome on the platform. American Legion Post 0083 on Main Street in Skenesborough. Here are some pics from last night and a pic of NE-1 @ Bozyhollow Road crossing from last Monday. What a stark contrast to last week. It’s been snowing on and off up here in Duanesburg and very windy all day with more than an inch on the ground. When I took that shot of NE-1 on the other side of the Valley it was in the 41 Degrees and sunny and I had just a hoodie on. Winter has arrived in the Burg! Having been absent for 2 weeks, the locals were pretty happy to see the Milk Run today.Here we see engineer Rolly Pauquette stopping to exchange greetings with Herm Hollister and pick up a small can of milk to top off the head end crew's lunch. The pleasantries out of the way, Rolly pulls her down for loading. The Milk is pretty heavy today with lots of empties to spot here and there. 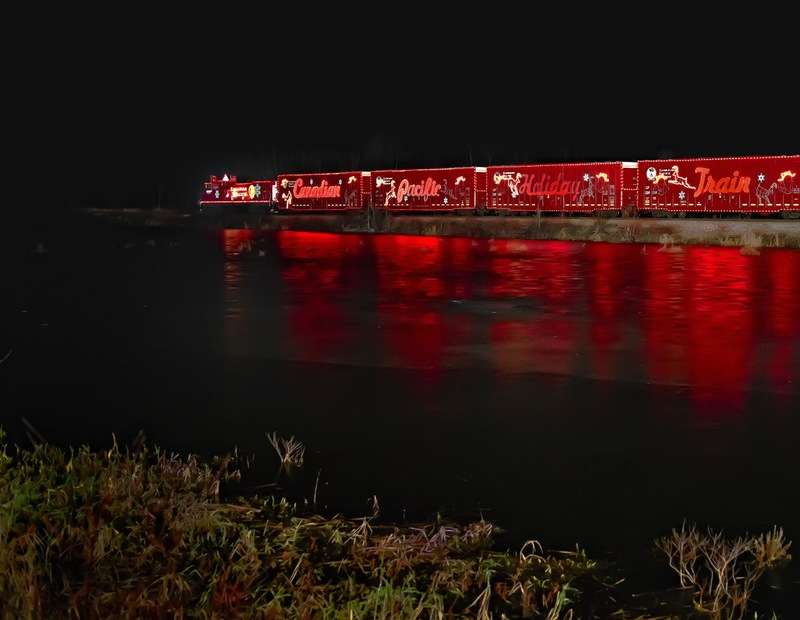 Arriving at favorite location Port Henry, I gave myself plenty of time to fix/tweak things that might go awry, after all, this is the southbound 2010 CP Rail Holiday Train making its annual deadhead move. This is the one shot of the year I do not want to be late for, ha,ha,ha! True to form, by arriving early, my plan allowed the D&H to entertain by running THREE northbounds by me, heading for their meets further north with the Holiday Train. The last northbound, empty ethanol 643, was heard over the radio up at nearby "Howards" passing siding speaking with the Holiday Trains crew........."You got the whole hillside lit up here!" Hearing this conversation just added fuel to the fire of drama, don't you know! 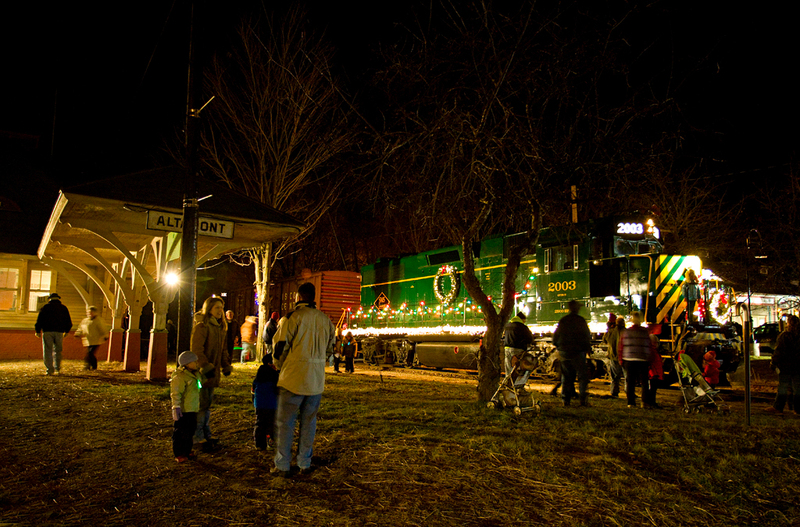 And twenty minutes later the Holiday Train announced its presence in town by blowing for the crossing a mile above me! WIth meets for the night completed, the dispatcher told the crew they had a straight shot to Saratoga now, where the next crew would board. 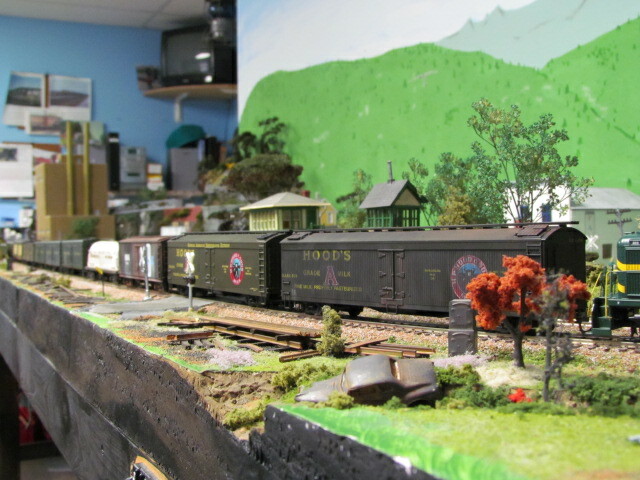 The sky behind the hill above the station brightens from the lights of the consist as well as the headlights, and round the curve emerges the spotless 9824 with the Holiday Train in tow! 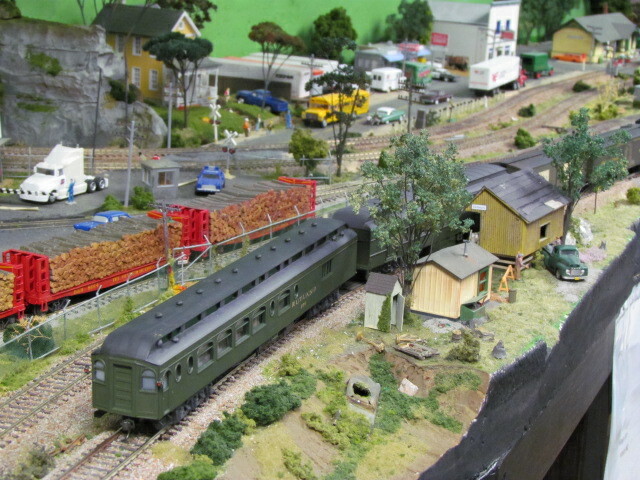 Complete with trademark christmas tree adorning the engine roof. The most beautiful train I will ever see! Fully involved, soaking in the annual moment atop the stepladder, a voice comes from the hand held scanner hanging from my parka........."Good morning Gary!" and I attempt a wave in return, then concentrate as 9824s pilot plow closes in on my familiar spot here. 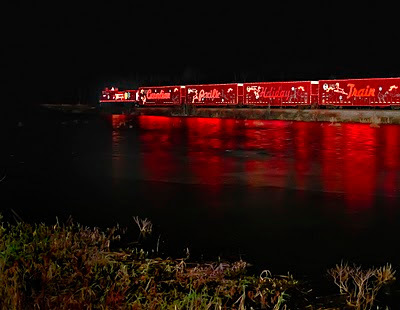 As the consist slowly passes by, I marvel at my good fortune.......what a sight to see at night! 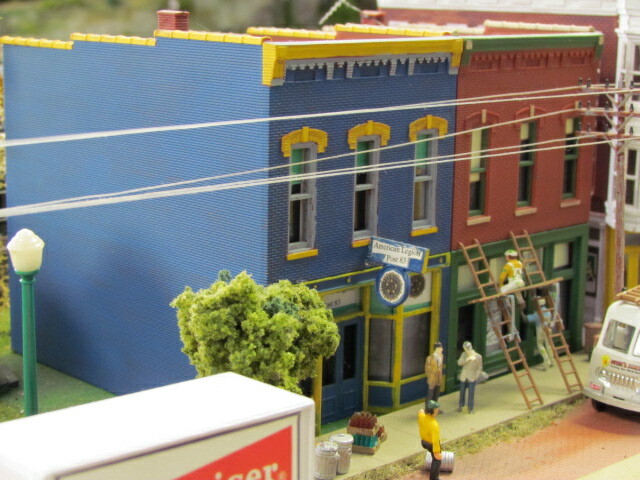 Shot in Port Henry, NY on November 27, 2010 at 03:19. It is difficult to believe in less than two hours, I had picked up the lighting, drove down to Rogers Island, (without an unscheduled interview with a NY State Trooper) and set up a handful of lights in time to capture the previous shot I sent you! A wonderful night indeed! Shot on November 27, 2010 at 05:14 in Fort Edward, NY on Rogers Island. 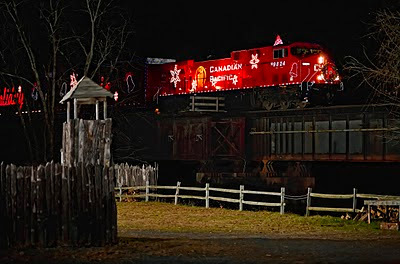 I wanted to try and find a location tonight, that showed the glamour the Holiday Train displays as it travels along the shoreline of Lake Champlain during its nocturnal schedule. Thinking the photo should give you the feeling of following along in the car, oooing and ahhhing as the train comes in close and swerves away again to go around a bluff with its reflection. 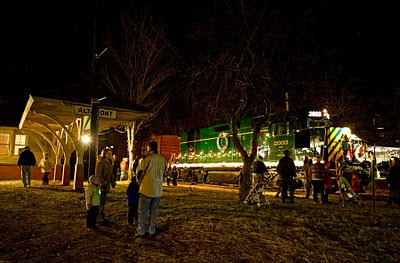 Most people who make the effort to get out and see this beautiful train prefer to see it at its station stops where the shows are held, never experiencing seeing the train moving through the scenic D&H North End landscape at night along the lake as you follow along. Realizing pacing around the compound would not bring results, I just put that thought in the back of my head.........how (where?) could I shoot an example of this "experience", and let it go. A couple nights back as I left Port Henry I passed this spot and it clicked! So we begin here tonight, south of Port Henry along Bulwagga Bay, waiting. I'm in a little pulloff along two lane Rte. 9N, which is seemingly filled with traffic speeding along. The neighbor across the way "somehow" notices my presence and leaves chopping wood to ask if I need any help. They all do that eh? Any excuse to get away from the woodpile? Ha,ha,ha! He introduces himself, and I get to meet Elwyn Lang. He admits to liking trains, ( I know, I know......I was shocked to, seeing where he lives, the view and all.......) and I go back to the civic to get paper and pencil to jot down his email for this list. So there we were, on either side of busy Rte. 9N, cars wizzing by at sixty per, I spot an upcoming opening.........and go for it, running across.............only to turn my head back forward and stop short as Elwyn did the same thing, LOL! We pause standing in the double lines, cancelling each other out, then we both cross back to the civic, and I record Elwyns email. 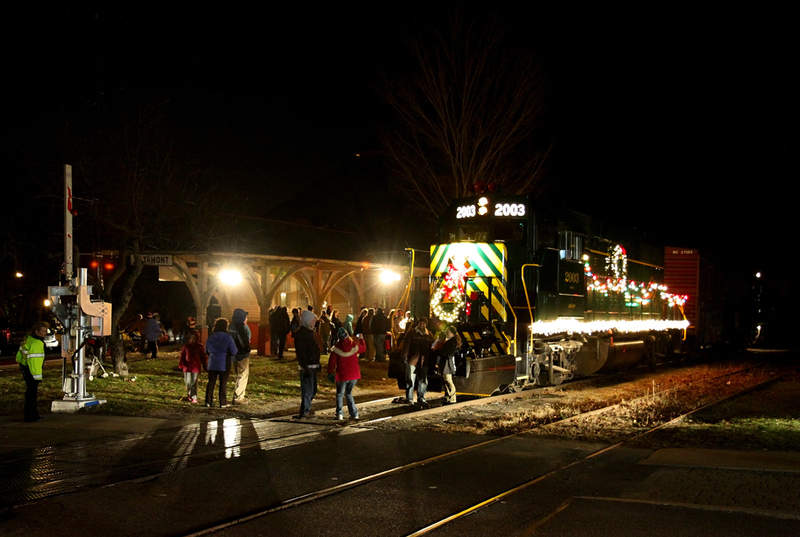 After he returns to the woodpile, its maybe fifteen or more minutes before 9824s air horn can be heard further south in Crown Point, and several minutes pass before the glow in the sky to the south transforms into the bright colors of the Holiday Train! This is a great spot to watch trains, being on the outside of a long sweeping curve, you get to see both sides of the Holiday Train as it passes. For the chasers following along, the 9824 closes to within perhaps thirty feet or less from Rte 9N before curving away again towards Bulwagga Bay, offerring the view attached. 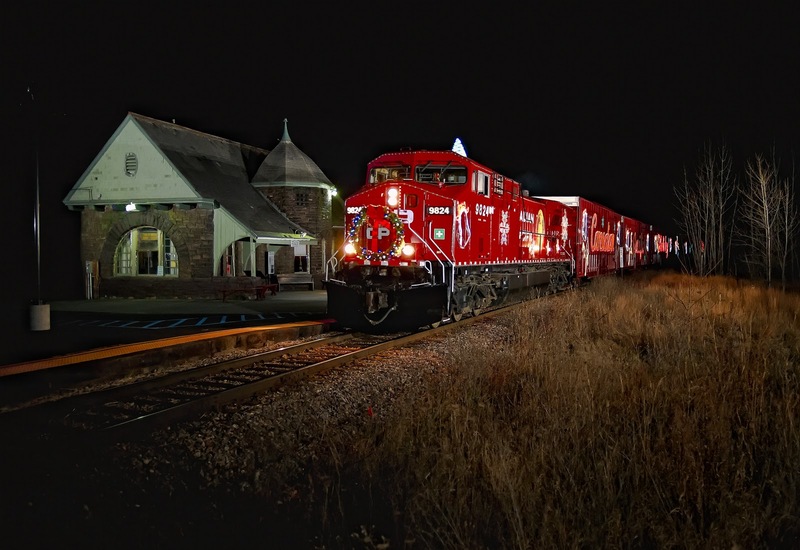 Providing a taste of the treat for the senses the experience of safely following the Holiday Train at night on the D&H North End offers, twice each year! 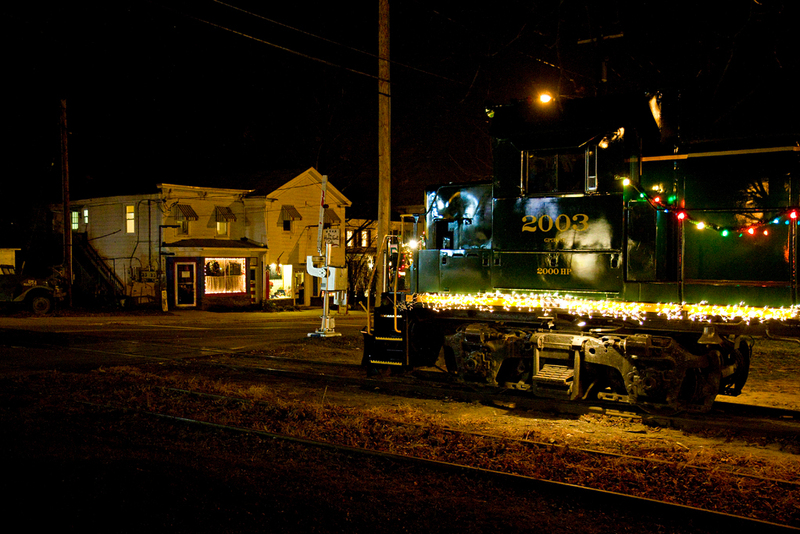 Shot In Port Henry, NY on November 29, 2010 at 18:01. Please enjoy! Comments are welcomed.